The City of Hiawatha, Iowa, USA, has a new flag. Here is the story and a photo of the flag: www.hiawatha-iowa.com/mod.php?mod=news&op=getArticle&sid=118. "We are proud to recognize Richard Tjarks as one of our flag designers. Richard's flag is now flying over our new city hall. 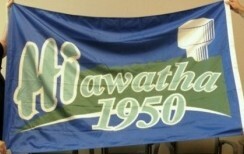 The new city flag will be a symbol of our Hiawatha community for a very long time. When Mayor Theis asked Richard how he came up with his idea, he stated that "Hiawatha stands out throughout our community and 1950 represents the city's beginning along with our unique water tower"."